Galvanised steel is steel that, with the adding of Zinc, goes through a chemical process to keep it from corroding. The Zinc is very affective and wont react with other impurities to cause rusting or corrosion and therefore once applied to the steel makes it far less likely to have a reaction with anything that could corrode or cause rust to the steel. This comes in especially handy when it’s used as galvanised steel fencing. Galvanised steel fencing becomes far more adept at protecting itself from the elements and could stand in certain areas far longer and need less care taken for it. The ability to be re-used and recycled many times over also gives galvanised steel to move from different uses so what might start out a bridge might turn into galvanised steel fence at some point if the bridge became obsolete. Another great factor is that galvanised steel is very cheap and while maintain its effectiveness it continues to be made into long lasting galvanised steel fencing. Ashlands fencing was built in 1999 and is a number one in producing top quality galvanised steel fencing in the UK. The company itself is based in west Yorkshire and has extensive experience in building security galvanised steel fencing all over the UK and has also build up good working relation with local authorities to provide them better security as well. Ashlands fencing has provided quality galvanised steel fencing for local primary and high schools and many private security gates and fencing. Ashlands fencing produces two types of galvanised steel fencing codi and axis which both serve best for different types of properties. Axis galvanised steel fencing is smaller in height but with a very solid build and is an ideal way to keep school and other local properties in the same mould safe. The codi line of galvanised steel fencing is far bigger in height and is great for producing a solid and sturdy security system around sports facilities and private owned land. The prices of galvanised steel fencing vary greatly depending on the size and location of the property that a client wants to surround. 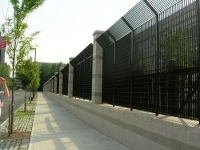 It also depends on the type of galvanised steel fencing they want to use and its style. A large factor a potential client will have to think about is the height of the galvanised steel fencing that they want because obviously the larger in height the fence the more material is used and they greater he price is. It can also be a good idea to measure out the exact measurements of each location and then talk to a manufacturer about what type of steel fencing would be best suited to fit your property. The best way to get a solid price is to ask from sellers of the galvanised steel fencing that you want to buy and they should give you an estimate of the payment needed to install your steel fencing as well as deliver your steel fencing to you.